Act quickly! These specials are only available for a limited time. Welcome Home To Tenzen. Tenzen is a community that has been completely remodeled inside and out – with condominium level, upscale interiors. Tenzen residents share a central courtyard in the trees, featuring a stunning fountain. In addition, residents will find a central patio with grilling area, comfortable seating, and heaters (for chilly nights). The Tenzen community is conveniently located for your car or your feet, easy access to I-90 and I-405 and just steps from shopping, restaurants, movies and services. Imagine walking to the grocery store in a matter of minutes. Give Us A Call… we’d love to show you your new home. Call our leasing office at (425) 747-4055. 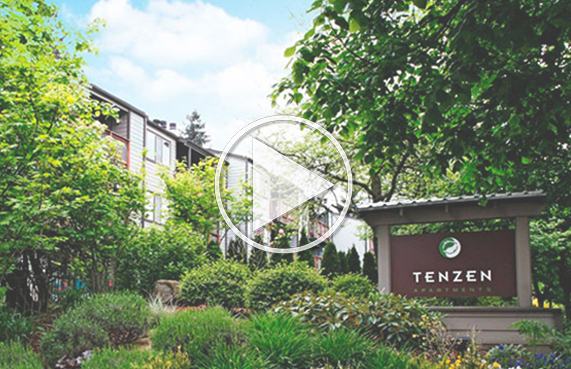 Want to take a closer look at Tenzen apartments? One bedroom and two bedroom apartment floor plans in a beautiful and secluded part of Bellevue, WA.